The sufficient-completeness property of equational specifications has been found useful in providing guidelines for abstract data type specifications as well as in proving inductive properties using the inductionless-induction method. The sufficient-completeness property is known to be undecidable in general. 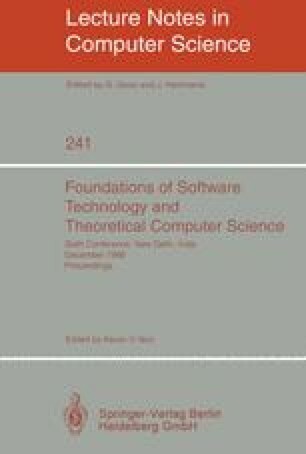 In an earlier paper, it was shown to be decidable for constructor-preserving, complete (canonical) term rewriting systems, even when there are relations between constructors. The complexity of the sufficient-completeness property under certain conditions is discussed. It is shown that the sufficient-completeness problem for term rewriting systems without any relations on constructors is co-NP-complete. However, the problem is PSPACE-hard even for linear constructor-preserving term rewriting systems when relations on constructors are allowed. Partially supported by the National Science Foundation Grant no. DCR-8408461.